You are invited to a big CD release concert at the Fulton Street Collective. 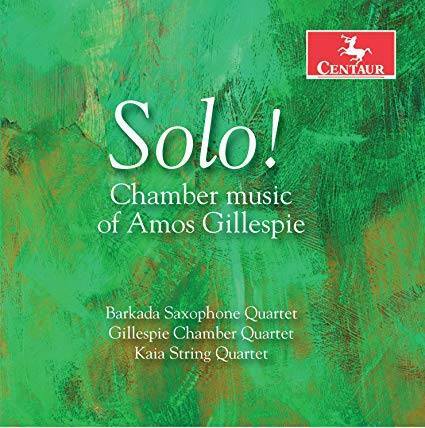 The album, titled “Solo!”, consists of music performed by the Kaia String Quartet, Gillespie Chamber Quartet, Barkada Saxophone Quartet and many others. It’s a selection of Amos Gillespie’s chamber music that has been featured on WFMT, Ear Taxi Festival, North American Saxophone Alliance Conference and other venues. The Gillespie Quartet along with the Lakeshore Rush Ensemble will be playing works from the album and other music by Amos Gillespie, Slava Kazykin and David Lang. David DeBoor Canfield from Fanfare Magazine described the album as "Work that packs a sultry sort of wallop;" "Gillespie writes with a distinctive, individual compositional voice;" "Strongly recommended." Admission: $15 includes CD or $10 without.